As a mother, keeping my son safe is my number one priority. After I wrote Jimmy Savile is Dead I started thinking more about how to keep Joseph safe. He had his talk on Stranger Danger at school not long ago, and alarm bells rang in my head. We are still not doing enough. On Twitter recently I saw that NSPCC had started a new campaign called The Underwear Rule. I really want you all to know about it, to read up on it and use it with your children. Talking about child abuse is scary, talking about body safety doesn't have to be. Some of PANTS I have been doing since Joseph was a baby, talking about who can touch him, why and when. It's really important. We are good at talking about Stranger Danger but the fact is that 90% of children who have been sexually abused were abused by someone known to them, not a stranger. The other startling fact is 1 in 3 children who were abused never told anyone at the time. Abusers are powerful, they are frightening, they tell the most awful lies. Mine told me my parents already knew and didn't care. He told me if I said anything he would hurt my sister. He told me I was worthless and noone would care and noone would do anything. Building trust with your child, letting them know they can talk to you anytime about anything without judgement is really important. Vitally important. The NSPCC site has some amazing resources, but perhaps the most useful is the question and answer page. Do it today, have that first conversation, and let me know how it goes. Wow. This is very powerful and useful stuff. Thank you for sharing. Listening to you read your Jimmy Saville post at BritMums Live sent chills down my back.Not for me, but for you and a friend of mine and all those who have/are going through this. Thanks Kylie. I've been talking to Pickle about his body using the proper words for about a year now (he's almost two), prompted by your initial blogpost. As a single Mummy, I'm aware that there is a higher risk for him being targeted. The resources on the NSPCC site are great - I've saved the page as a favourite. You are an inspiration. Thanks for sharing this Kylie. 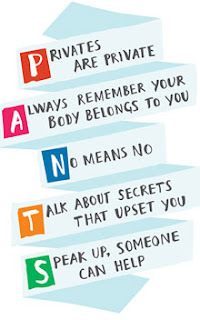 I wasn't aware of the PANTS campaign, but it's brilliant - so simple.